OK it’s not in Reno but I am doing a public service by reviewing it because I believe that Tony’s makes some of the best, if not the best, pizza’s in USA. I know, I know, this is quite a statement to make, but don’t take my word for it, take the word of the World Pizza Cup which Tony Gemignani, the restaurant’s chef/owner, won in 2007. He was the 1st American and 1st non-Neapolitan to win this event and from what I can taste, he earned it. 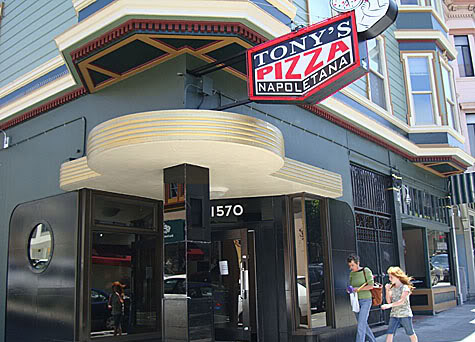 I’ve eaten in many of the best pizza restaurants in the US and in my mind what really sets Tony’s apart from the other high-end competition in the US is that unlike other places which typically specialize in only one kind of pizza, Tony’s is a Tour De Force of world class pizza making. He has not one, but 4 different pizza ovens (gas, coal, electric, and wood) making everything from classic Neapolitan, to Sicilian, to NewYork, to California, to Detroit, to St. Louis Style (really? ), to you name it. The only style he really doesn’t have is deep dish Chicago. The breadth and depth of the pizza menu is mesmerizing. It’s also a bold statement by Tony that he has the confidence and the chops to make almost any style of pie out there. It’s as if he has thrown down the gauntlet to the rest of the pizza making world. Bravo Tony! What’s more, no matter what the style, the pizza’s are almost always awesome. 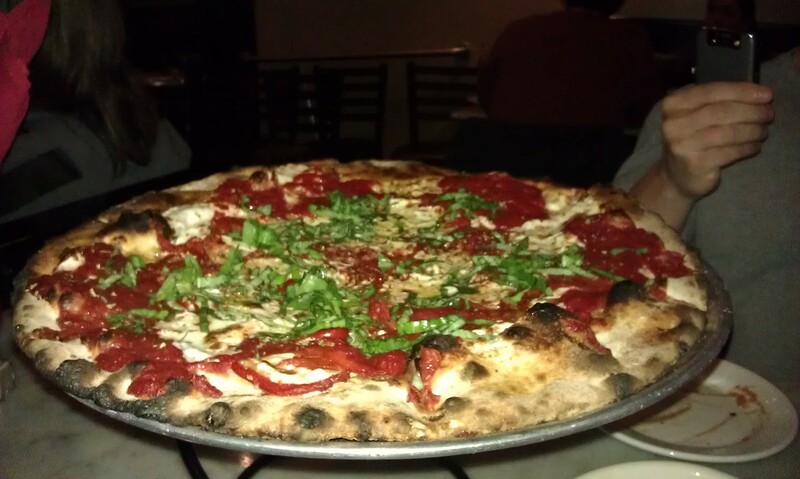 The wood-fired, award winning Neapolitan Margherita lives up to its award. The crust is airy, chewy, textured and light. The sauce and cheese, just right. In a word, amazing. I’ve had about 8 pizza’s here and not a single one missed. They were all cooked to perfection with authenticity and real craftsmanship. If you really love and appreciate good pizza, you must go to Tony’s and order as many different style of pies as you can. You will not regret it. The restaurant itself is located in the North Beach section of San Francisco, famous for it’s sidewalk cafes and lack of parking. It’s a sit down, full service restaurant with a full bar and and two separate small dining rooms. The menu includes several appetizers and salads, but beyond that it’s just pizza (and thankfully so). The server’s are quite knowledgeable about the different pizzas and clearly take their pizzas seriously. Service is generally fast and efficient, though sometimes a bit hectic because the place is usually packed. Tony’s is right on the corner of Stockton & Union St. If I had one complaint it’s that they don’t take reservations. You have to show up and put you name on a list. On a busy night, it can be a long wait! If you just can’t wait, here’s a secret: attached to the restaurant is a walk-up pizzeria serving both slices and pies, so if you can’t stand the wait you can still get your Tony’s fix, albeit in a much more casual atmosphere. The amazing thing to me is that the pizza’s are reasonably priced, starting at $19 for most plain cheese (including the award winning Margherita). It’s a fantastic deal for the quality of the ingredients and craftsmanship that goes into each pie. In short, Tony’s is perhaps the perfect pizza restaurant. It has an amazing array of world class pizzas crafted by an award winning chef at surprisingly reasonable prices. It could use a reservation system, bigger space, and better parking, but that’s a small price to pay for what might be some of the best pizza you’ll get anywhere.